I try to source a variety of different sustainable fabrics from a variety of sources for each collection. When looking for new fabrics, my first concern is quality: if a fabric is not well-constructed, there's no point in making a well-constructed garment out of it. My second concern is sustainability: if it is made out of a non-renewable resource (e.g., polyester), or causes undo amounts of pollution (e.g., nylon), or is threatening to the environment as a result of something like overgrazing (e.g., cashmere), I'm not going to use it. My final concern is aesthetics: my goal is not to make clothing out of sustainable and high-quality fabrics just because they are sustainable and of high quality; the fabrics I use also have to be beautiful in their own right. When I first discovered handloom fabrics, I fell in love. They're soft, textured, and subtly imperfect. You can see and feel the quality in each warp and weft thread. Once I learned how little an impact they have on the environment, I knew I had to try to incorporate them into every collection. 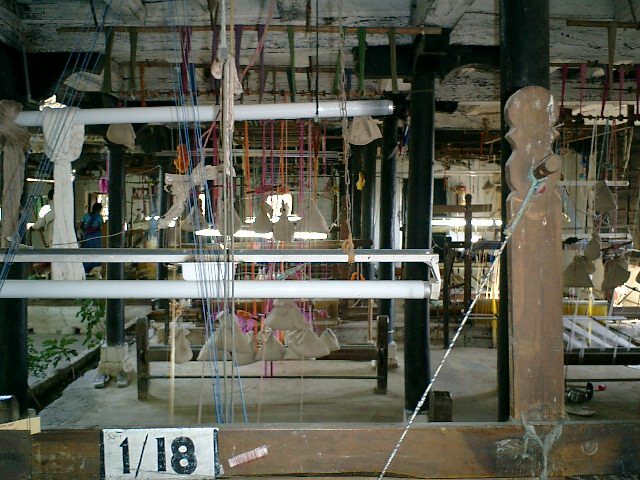 The handloom has been around as long as fabric itself has been around. It was the way essentially all the world's fabric was produced up until the invention of electricity and the emergence of power looms and industrial mills. Despite the emergence of industrial fabric production in the last few centuries, rural areas in countries such as India are still populated with many skilled weavers; handloom remains the second-largest industry in rural India after agriculture even today. As the handloom craft has remained virtually unchanged for years, it is a highly sustainable process, requiring no electricity and having a 30% smaller carbon footprint than machine-milled fabrics. The handloom industry also employs nine times as many people as the machine-milled fabric industry. If you've never seen or felt a handloom fabric, you're in for a treat. The quality and beauty of these fabrics cannot be explained in words. You can take a look at our FW16 handloom styles here.